Virtualisation isn’t just about storage. Virtualisation of the operating system is becoming increasingly popular as well. By virtualising the operating system, companies are able to consolidate servers, increase central processing unit (CPU) and memory utilisation, and provision new servers faster. One company that has benefited from virtualising the operating system is international labour and recruitment firm Manpower. Historically, in Asia, Manpower operated with decentralised IT management. Each office managed its own computer rooms or datacentres. Then, about two years ago, Manpower decided to rationalise its operations. “We decided to consolidate all our datacentres into one in Singapore and outsource it [all] to IBM,” says Richard Ho, datacentre and service delivery manager of Manpower Asia Pacific. “The vision of Manpower’s IT is to create a simple infrastructure, drive costs down and simplify management. Consolidation is the key to making things simple,” he adds. Before consolidation, the company had about 200 servers across the region, with five in New Zealand. It now has 70 physical servers in Singapore, having consolidated about 150 already, mainly from Japan and Australia. The New Zealand servers, currently hosted by outsourcer Datacom in Auckland, are scheduled to shift to Singapore next month. Of the 70 servers, 25 are running VMware’s ESX, a virtulisation solution from VMware. On average, each physical system hosts about four virtual machines. Manpower manages all the different virtual servers by using VMware’s VirtualCenter administration tool. VirtualCenter serves as the central point of control for managing, monitoring, provisioning and migrating virtual servers. “Through VirtualCenter, we can view our entire infrastructure, manage and monitor the performance of physical servers and virtual machines, plus provide secure access to certain virtual servers,” says Ho. VirtualCenter’s ability to do rapid provisioning for virtual servers with deployment wizards and virtual machine templates has reduced the time needed for creating and deploying virtual machines. “Our service level to our internal customers has gone up. We have multiple environments — production, development, testing, staging and user acceptance testing. Internal customers need servers on the fly. If you actually have to prepare a physical server it takes a few weeks. 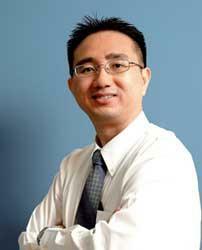 With a virtual server, we can clone from the template and have the new server up and running in a few hours,” says Ho. Another administrative tool he finds useful is VMware’s VMotion. This allows the IT department to move a virtual server from one physical server to another without affecting any of the services. “In the datacentre, we have to create different zones [including] internet-facing zones and core zones, for security purposes. These zones have different security levels. Very often we need to move servers from one zone to another. With VMotion we can move virtual servers on the fly from the core zone to the internet-facing zone quickly with no downtime,” says Ho. Manpower faced some initial resistance from the regional offices that were going to have their applications hosted on virtual servers in Singapore. According to Ho, people were uncomfortable with not being on a physical server. To allay their concerns, Manpower set up their applications in a test environment first. The company would run the test for two to three months. After everyone was satisfied, move the application to a virtual production server. Overall, according to Ho, Manpower is pleased with its virtualisation strategy, which has enabled the company to rationalise resources, lower the operating and maintenance costs, increase uptime and improve quality of service. According to Jim Lenox, VMware’s Asia South country manager, virtualisation is becoming increasingly popular in the datacentre. “Today nearly 90% of servers sold are on the x86 infrastructure,” he says. “Traditionally the x86 infrastructure has been the most under-utilised part of the datacentre. Through virtualisation, not only have x86 infrastructure utilisation rates improved, but it’s now possible to achieve the levels of reliability, availability and scale using industry-standard servers that were previously only possible with high-end RISC and mainframes.